Hi, Thank you, friends and viewers. 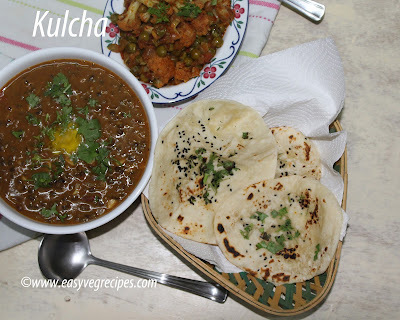 Today I will post how to make kulcha -- plain kulcha recipe. Kulcha is another North Indian flatbread made with all purpose flour or maida. It is most popular in India and Pakistan. It is made with maida and served with chole, dal makhani, or any spicy and juicy curry. I get confused with naan, kulcha and lachcha paratha. Later noticed that all of them are totally different and made in different ways. Sometimes they all look alike but they are different, like humans. All of them are made with all-purpose flour only but the way they are leavened is different. Naan is leavened with yeast, kulcha with baking soda and baking powder whereas lachcha paratha is not leavened at all. Normally kulcha and naan are made on the tandoor. As we do not have tandoors at home, we can use an alternative method to make it. I cooked them by placing them directly on the flame as we do it for cooking roti. But for roti we do not apply water to it, for kulcha I applied water on one side. First cooked that side on the pan then flipped and placed the other side on flame cooked on low flame. This technique I picked from a website. I served kulcha with dal makhani and gobi mattar curry. In a wide plate or bowl, add all purpose flour, baking soda, sugar and salt. Mix them well. Add curd, milk and oil to the above dry ingredients. Mix them well. Add little water at a time and combine to make smooth and soft dough. Knead a while. Cover the dough with a damp cloth and keep it aside for two to three hours. After two hours knead the dough again and allow it to rest for one hour. Take one portion and flatten it between plam. Dust the flat surface with dry flour and roll the flatten dough ball into 3 to 5 inches diameter. Sprinkle teaspoon full of kalonji and coriander leaves. Again roll it. Flip the flatten kulcha and apply little water. Heat roti tava over medium heat and place the kulcha on it. While placing the kulcha see that greased with water side stay on tava. Cook on medium flame till the bubbles appear. Slowly lift the kulcha from tava and place it on flame directly, but take care that it should fall on the flame. Let the other side also cook completely or till brown spots appear. Apply little butter on top of it. Cook all other kulchas also in the same way. Serve Kulcha with dal makhani or gobi matar.